ACANA Heritage foods are ACANA's original Biologically Appropriate™ recipes that celebrate their 25-year tradition of featuring fresh regional ingredients grown close to home by farmers, ranchers and fishermen they know and trust. Prepared in their Kentucky DogStar® kitchens from America’s best and freshest ingredients,these unique and Biologically Appropriate™ foods are a delicious way to keep your dog healthy, happy, and strong. That’s why Acana loaded ACANA Freshwater Fish with Rainbow trout from Idaho, whole Blue catfish from Kentucky, and wild Yellow perch from the Great Lakes - all delivered fresh or raw in richly nourishing WholePrey™ ratios. Rich in meat (60%) - Your dog is biologically adapted for a diet rich in meat. That’s why we loaded ACANA Freshwater Fish with 60% fish, including Rainbow trout, whole Blue catfish and wild Yellow perch, all sourced from American waters. High fresh meat inclusion - Fresh meats are in their most natural and nourishing form. That’s why 1/2 of the fish in ACANA Freshwater Fish are authentically fresh or raw, and loaded with goodness and taste, and 1/2 is dried to provide a strong and natural source of protein. A variety of meats (3) - In nature, dogs benefit from an assortment of prey animals. 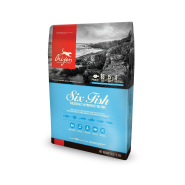 That’s why ACANA features a diversity fresh fish in richly nourishing WholePrey™ ratios of meat, organs and cartilage, which mimics your dog’s natural diet and eliminates the need for long lists of synthetic additives. Rich in meat protein - Entirely free of the pea or potato protein concentrates found in today’s dog foods, ACANA derives its rich protein content from premium animal ingredients (not plants), supporting lean muscle mass and nourishing your dog according to his evolutionary needs. Carbohydrate limited - ACANA limits carbohydrates and replaces fast carbohydrates (such as rice, potato and tapioca) with low-glycemic fruits and vegetables. ACANA Freshwater Fish features an unmatched variety of local ingredients that are raised by people they know & trust sourced from federally inspected facilities, and then delivered to their Kentucky DogStar Kitchens fresh or raw!